The evergreen dogwood tree is Cornus capitata also known as the Himalayan strawberry or dogwood. This is a small tree that will reach a height of around 9m in good conditions although often less. Green foliage is maintained through the year however some leaf fall in winter will occur in cooler climbers. The evergreen dogwood has large yellow flowers that appear from late spring to summer are attractive, followed by green fruits that turn yellow then red on ripening. Although a useful landscaping tree it does have its problems, firstly it will self seed, and as birds are attracted to the fruit it will spread through native forest areas and can be a little ‘weedy’. In the garden these are easily pulled out when young. However the main issue in the garden is the fruit which can be fairly messy and if planted near a pathway will require a ‘daily clean’ when in full fruit, unfortunately in larger established specimens this is over a few months. 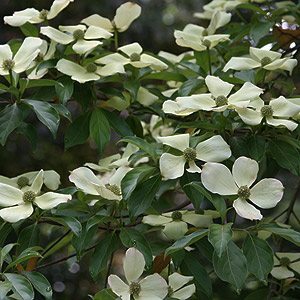 Evergreen dogwoods are not that fussy about soil conditions although it will thrive in humus rich moist conditions. Fairly fast growing at the begining it then slows the growth rate and take 20 – 30 years to reach a fully mature specimen. Although little pruning is required, it can become a little leggy in shaded positions and may require some attention. In larger gardens the Evergreen Dogwood (Cornus capitata) as a feature tree, or at the rear of the garden border to provide some shade. We suggest that you do not plant Evergreen Dogwood tree near paths or driveways due to the fruit drop.